I am kind of amazed at how many dogs have car sickness issues. She loves going with me… but she hates the car. She used to get car sick when she was a puppy. Thankfully, most puppies grow out of car sickness. But there are a few dogs that, if not treated, continue to struggle as adults. 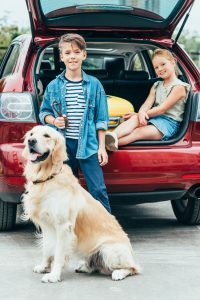 If you see any of the above signs, there are a few easy tricks to help your dog feel better in the car. I have had a few dog training clients whose dogs who were so scared that they wouldn’t even get in the car. For these dogs, I recommend feeding them in the car. Just open the door and set his bowl inside. Don’t move the car (yet). Just let him get a happy feeling regarding the car by allowing him to eat there. Once he is jumping into the car to eat, and is not at all fearful, you can start the car and feed him inside. From there you can move the car out of the driveway. You want to gradually build up your dog’s tolerance to a car. Take a few days to a week to work on this. If your puppy or dog gets sick in the car, go for short, fun trips. Drive to a nearby park and let him out to play. Remember those clients I mentioned: one of them had a HUGE black lab that refused to get in the car. I suggested that after getting him into the car they make a short trip to McDonald’s… all it took was ONE time, and the dog was psyched to get in the car after that. They thought I was a miracle worker! Taking short trips repeatedly will help your dog realize that a car ride is not be a reason to get sick. Crates are a HUGE help! Sometimes the visual experience of the world moving can make a dog nauseous. By blocking his vision, you can actually be helping out! A little bit of airflow can do wonders! Turning off the A/C, opening the windows, and letting fresh air into the car will help prevent car sickness. The floorboard is another place that the dog won’t be stimulated by things moving so quickly. It also puts him in a spot where he will feel the least amount of movement. 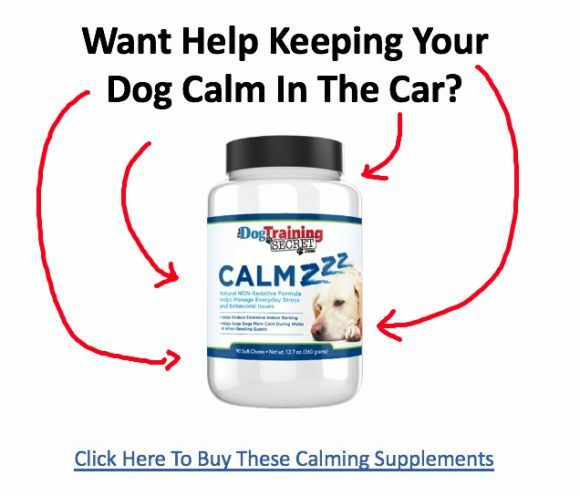 Supplements that help your dog remain calm can also be very effective. Follow these tips, and your dog will thank you for it!